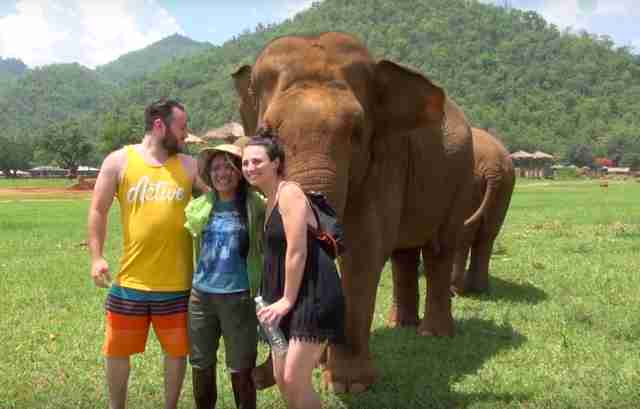 Some people say music is the universal language — and this elephant certainly seems to think so. 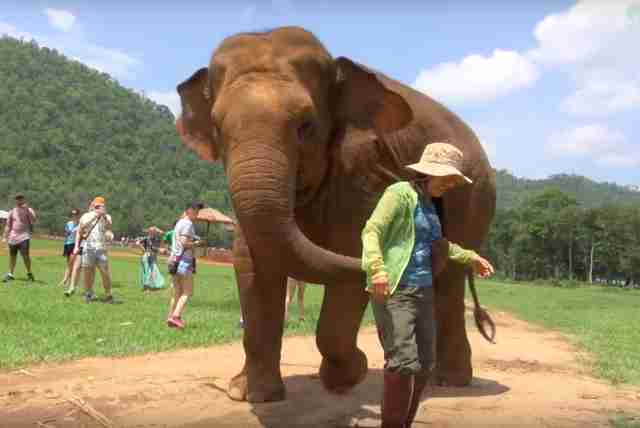 Earlier this week, Lek Chailert, founder of the Elephant Nature Park in Thailand, was meeting with some visitors at the sanctuary when they were suddenly interrupted by one of the elephant residents, 9-year-old Faa Mai. 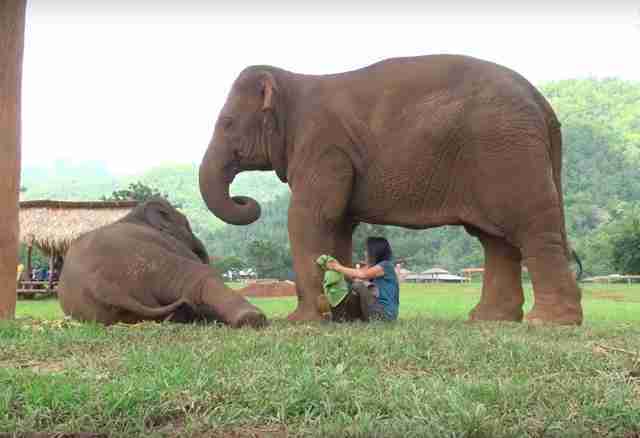 Faa Mai clearly didn’t care that her friend was busy, and began to playfully push Chailert out into the field, tapping her with her trunk or even wrapping it around her whenever Chailert tried to stop. “I wondered what it was that she really wanted,” Chailert said. After a short walk, Faa Mai finally reached her destination with Chailert in tow. 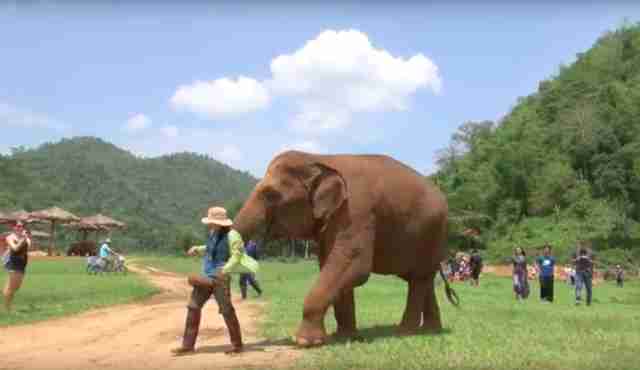 Straight ahead was Thong Ae, a newly rescued elephant calf whom Faa Mai has sweetly taken a particular liking to. “She wants to adopt [her] as her own,” Chailert explained. And Chailert knew instantly just what Faa Mai wanted: a song. “Faa Mai wanted me to lullaby her little friend, as she is so fond when I sing a lullaby to her,” Chailert said. She settled down in the grass underneath the two elephants and started singing, and they held each other's trunks as they listened along. Naturally, young Thong Ae started to grow tired. She leaned down for Chailert to rub her back, and then she stretched her large body out in the grass underneath a tree. For Chailert, the moment was just another reminder of how incredibly sweet and thoughtful elephants really are. 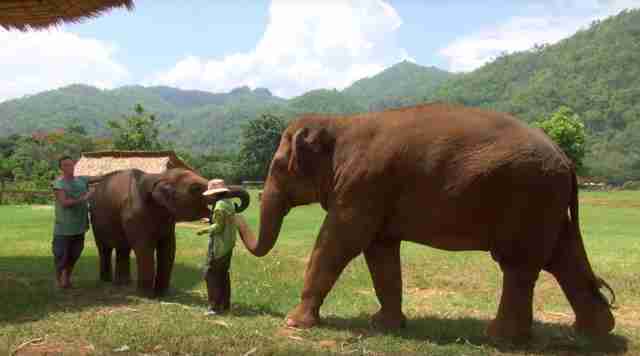 To help more elephants like Faa Mai and Thong Ae live a great life, you can make a donation to Save Elephant Foundation.